The sage advice of the King in Alice in Wonderland to the White Rabbit may be the worst possible dictum for writers: “Begin at the beginning . . . and go on till you come to the end.” If we follow this command, we may only increase our angst and creative paralysis. When I coach doctoral candidates, I often advise them not to start at the beginning, that is, with Chapter 1. They sometimes think I’m nuts, but, a heretic in the King’s court, I’ve got sound reasons. In the first chapter, the writer must present thorough and concise overviews of the background of the problem to be investigated. This presentation requires (a) great familiarity with the breadth of the topic and (b) greater familiarity with previous studies of the particular subject. Most candidates don’t get to know what they’re really writing about, much less what previous scholars wrote what and why before them until they’ve been living with their dissertation for several months. So I advise them to start with Chapter 3(!). This chapter describes the methods of the study, and the style should be very straightforward, with precise descriptions of the steps the candidate will take to conduct the study and reach conclusions. I often compare the style required to a cookbook: First, I will create a flyer for recruiting students to complete my questionnaire on their most effective study habits. Then I will seek permission from the office of student affairs to post the flyer on campus bulletin boards. Next I will . . . When I start clients with Chapter 3, they gain some great advantages. The can break into the work with at least a minimum of apprehension; they can get going writing something. Seeing their paragraphs miraculously mount gives them the needed confidence to keep writing. Writing in turn loosens their fear-paralyzed minds so they become more creative about, in our example, where to recruit, who to recruit, when, and many other considerations. Just to start, with anything, helps enormously. My reflections here in a way resurrect the old debate between writing from outlines and writing by “free flow.” Some writers feel secure with a sheaf of outline notes, in starched order. Plenty of bestselling authors have used and use outlines, sometimes of staggering complexity and even artistry—Joseph Heller, Sylvia Plath, J.K. Rowling. See the fascinating article by Emily Temple, “Famous Authors’ Handwritten Outlines for Great Works of Literature” (Flavorwire, May 13, 2013, http://flavorwire.com/391173/famous-authors-handwritten-outlines-for-great-works-of-literature/9). Other authors all but gag at the thought. In an interview, Margaret Atwood was asked if she uses outlines. “I did that once,” she replied. “It was a terrible mistake” (Kristin D. Godsey, “Unlocking the Door,” Writer’s Digest, April 2004, p. 48). Like Atwood, I often feel hamstrung with a stringent outline and the pronouncement to begin at the beginning. Even when a brilliant opening knocks at my notepad, I have to feel along where to go from there. My notes often dribble into an entire section of an article or novel, but it lives in limbo like astronauts’ shuttle photos of the Earth hanging in space. I usually don’t know where the scribbled passage will fit into a piece, but I obey the compulsion to just get it down. Granted, for a long work, or one that spans decades or generations, an outline can be a lifeline, but you may find it serves you best after the major draft. For me, then, linearity is often the enemy of creativity. Despite pen-top chewing, I’ve learned to trust the process. Through many drafts, I eventually get there. As you trust your own process—outline, inline, midline, no line—you will too. 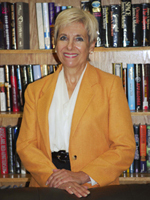 Author, editor, writing coach, and spiritual counselor, Noelle Sterne writes fiction and nonfiction, having published over 300 pieces in print and online venues, including Writer’s Digest, The Writer, ReadLearnWrite, Women on Writing, Transformation Magazine, 11.11, and Unity booklets. Her monthly column, “Bloom Where You’re Writing,” appears in Coffeehouse for Writers. With a Ph.D. from Columbia University, for over 28 years Noelle has helped doctoral candidates complete their dissertations (finally), with a practical-psychological-spiritual handbook in progress. In her book Trust Your Life: Forgive Yourself and Go After Your Dreams (Unity Books; one of ten best 2011 ebooks), she draws examples from her practice and other aspects of life to help writers and others release regrets, relabel their past, and reach their lifelong yearnings. With Trust Your Life, Noelle appears in the Unity Books 2013 “Summer of Self-Discovery.” Discussions appear on Goodreads: http://www.unity.org/publications/unity-books/summer-reading-series, Her webinar on the book of June 26, 2013, can be heard and seen on YouTube: www.youtube.com/watch?V=95EeqllONIQ.